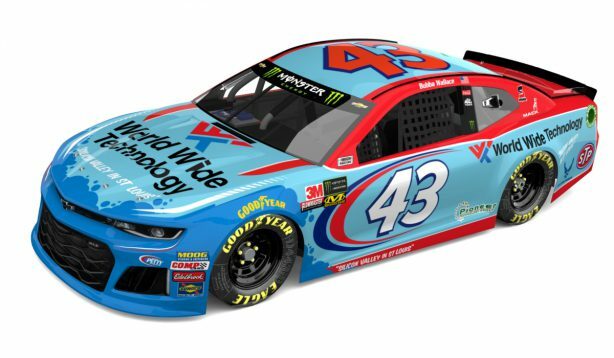 Welcome, N.C. – December 20, 2018 – Richard Petty Motorsports (RPM) and World Wide Technology (WWT), a market-leading technology solution provider, announced today an extension of their official partnership that began in 2018 naming WWT the Technology and Analytics Partner of RPM. As part of the extension, WWT continues to be a primary sponsor of the No. 43 Chevrolet Camaro ZL1 team and will be a major associate sponsor throughout the 2019 season. In addition, WWT will continue to provide RPM with data analytics, consulting and technology solutions. This past season, WWT embedded a team of its data scientists within the organization to analyze information to optimize the team’s performance on the track. The result was a one-of-a-kind, proprietary dashboard used late in the season by the team. Showcasing improvements early on, initial results included a seven percent increase in Average Running Position, a 10 percent increase in Average Finish, and improved strategy decision-making by the crew chief and race engineers. Additionally, the dashboard featured artificial intelligence (AI) for visual data classification and combined more than five data sources onto one screen for improved data visualization, allowing for better performance comparison (e.g., tracking speed against the other cars). “In a short time, we’ve seen the immediate impact World Wide Technology can make on our race program with their big data analytics,” said Brian Moffitt, chief executive officer, Richard Petty Motorsports. “Their continued partnership will have a significant impact on the performance of our race team through data analytics, application enhancements and creation of proprietary performance focused applications. We are fortunate to have WWT as a partner and they are committed to making Bubba and the No. 43 team a winner. A performance and marketing driven company, Richard Petty Motorsports (RPM), co-owned by NASCAR Hall of Famer Richard Petty and successful business entrepreneur Andrew Murstein, is one of the most recognized brands in all of motorsports. RPM is the winningest team in NASCAR Cup history with 273 wins and has business partnerships with national and global leaders. Today the race operation fields the famed No. 43 in the Monster Energy NASCAR Cup Series with driver Darrell “Bubba” Wallace Jr. The team is headquartered in Welcome, N.C.
World Wide Technology (WWT) is a technology solution provider with more than $10 billion in annual revenue that provides innovative technology and supply chain solutions to large public and private organizations around the globe. While most companies talk about delivering business and technology outcomes, WWT does it. Based in St. Louis, WWT employs more than 5,000 people and operates over 2 million square feet of warehousing, distribution and integration space in more than 20 facilities throughout the world.